3-In-1 Pop-Up Tent Play Just $36.99! Down From $70! PLUS FREE Shipping! At Amazon, you can score this 3-In-1 Pop-Up Tent Play for only $36.99 down from $69.99 PLUS FREE shipping! As a parent, you want to provide all the best for your kids. In the development process of childhood, the role of fun and games is much bigger than meets the eye. Not only does it affect full development of motor skills, it is also the way kids learn and get to know their surroundings. This is why your encouragement of playtime is crucial. As kids play with just about anything, you could learn a thing or two more about the different types of toys and see how you can contribute to more involvement of imaginative play. You would be surprised to know a fun toss it game zone happens to be one of the best toys to inspire children to use their imagination. 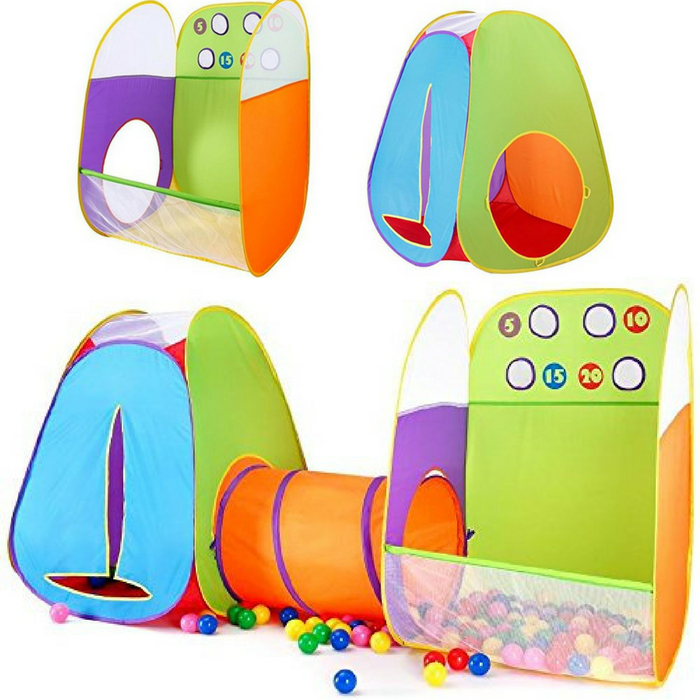 FUN FOR PLAY AND GAME: This FUN TOSS IT GAME ZONE comes with 3pcs play tent, crawl tunnel and toss it ball pit, for your little ones to enjoy their sports. It keep your kids active and encourage social play and sharing. Kids can play all day in this game center indoor or outdoor. TOSS IT GAME DESIGN: These FUN TOSS IT game help to stimulate hand and eye coordination. Kids can also count the number to learn math in playing. This game zone helps to develop your kids multi abilities when they are playing. EASY SET-UP & STORAGE: Setting up this game zone is a fast and easy process that does not take longer than a few minutes. The unique POP-UP folding capabilities allows it to be taken down and stored anywhere in your home. It folds into a small portable carry bag that can also fit in a suitcase or car trunk for vacations. HIGH QUALITY: 100% Polyester, delicate sewing, air flow, super soft material. Sturdy fiberglass rods and ring frames support the tent without worry of collapse. It also comes with a cute storage hand bag so you can easily take it for outdoor use. Easy clean up! A quick scrub with a wet rag and all the dirt will disappear. Alvantor is a registered trademark. Knight Castle Play Tent Just $19.98! Down From $70! For a limited time only! 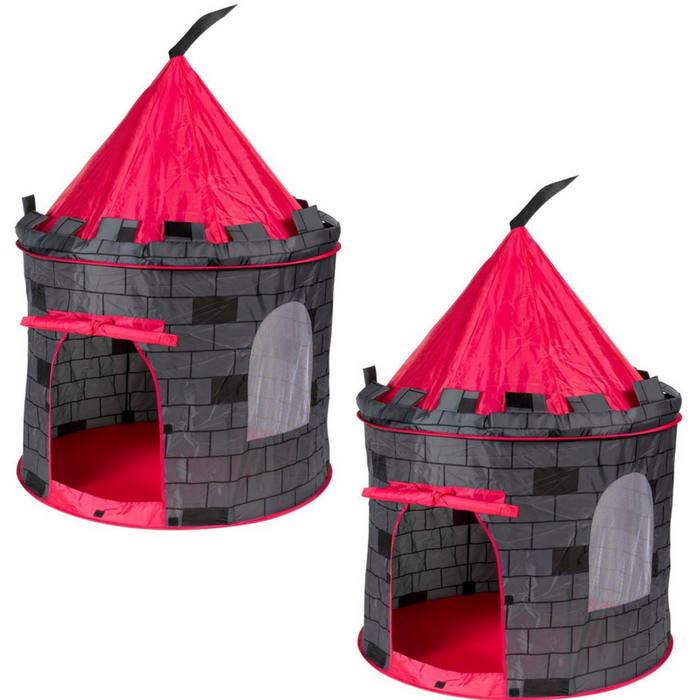 Amazon has this Knight Castle Play Tent on sale for just $19.98 down from $69.98 PLUS FREE shipping with Amazon Prime or for orders $25 and above! This Knight castle is an adorable gift for all boys. Fast and easy set up/breakdown with no tools required. The lightweight tent with a zipper carry bag is great for indoor or outdoor use. Its small size is easy to fit in compact home or kids room. The playtent can be folded flat for convenient storage when it is not in use. 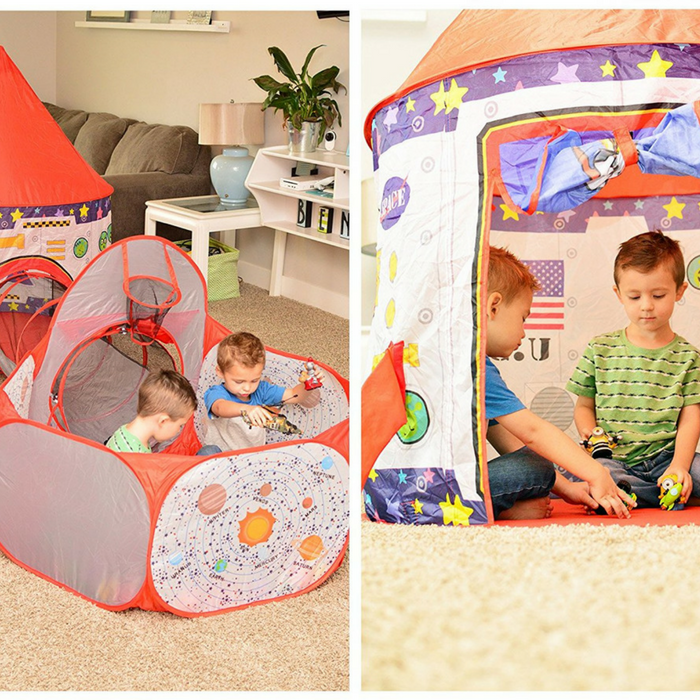 3-Piece Rocket Ship Play Tent Just $47.95! Down From $100! PLUS FREE Shipping! Head over to Amazon to get this 3-Piece Rocket Ship Play Tent for just $47.95 down from $99.95 PLUS FREE shipping! Let your child’s inner astronaut come alive with this perfect 3pc galactic adventure play set. They will occupy themselves for hours at a time jumping, crawling, & playing hide-and-seek while learning all of the planets with our educational ball pit design. Your kids are going to have fun! ASTRONOMY TOYS FOR KIDS: Your child will take off into an outer space adventure with this 3-piece playhouse castle tent, crawl tunnel & basketball pit with hoop. With our one of a kind space shuttle rocket ship design, their imaginations will come alive as they enjoy endless hours of space exploration while crawling & playing in the playland ball pit. NASA BABY APPROVED: We were inspired by dozens of little kids opinions which led to our innovative child-friendly & educational design. Soft thick fabric, breathable mesh walls, and flexible padded structure gives your child the safest enjoyable experience. Playz® toys always meet & exceed all USA CPSC Toy Safety Guidelines. FAST INSTANT ASSEMBLY: Portable, durable, easy to setup & foldable into a lightweight zipper carrying bag for convenient storage underneath your couch! The tunnel, tent & ball pit can be used all together, as a 2pc set, or individually using the velcro cover for tunnel openings. PLAY PIT BALLS ARE NOT INCLUDED.